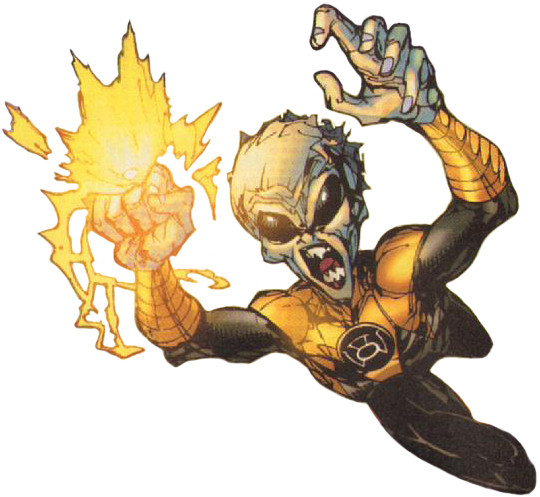 Due to the all-Corps truce following the Blackest Night, Kyle Rayner was present on the Sinestro Corps home world Korugar trying to stop a train from derailing and killing hundreds of Korugarians. As Kyle braced the tracks and evacuated the trains, he was approached by Arkillo, Maash, and a rookie Corpsman, from Space Sector 703. The rookie was a humanoid alien, distinguished by a large empty cavity on the back of his head where his brain would be located. Although the truce remained, these "Sinners" took advantage of the opportunity to mock Rayner for his concern over the helpless Korugarians. Unfazed Kyle took the opportunity to dub the rookie "No Brainer".